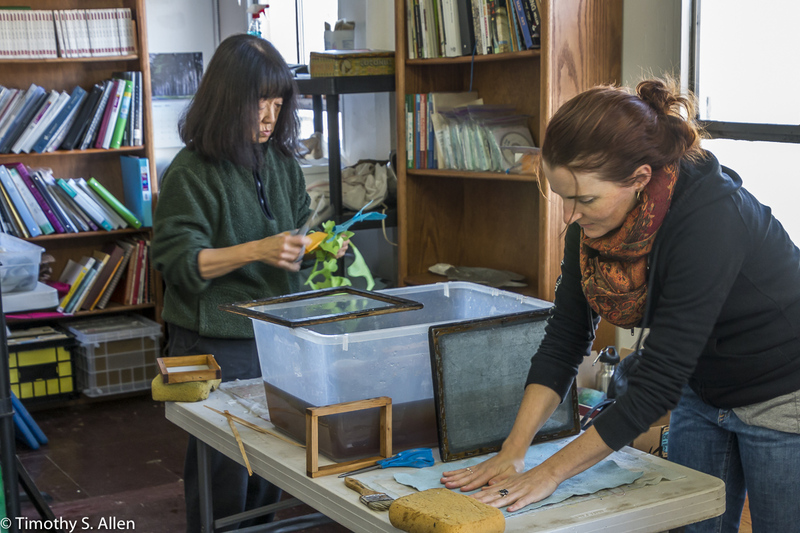 Here are also some photos taken by one of the workshops participants, Tina Hittenberger, showing the hand beating of eucalyptus bark fiber on my Craig’s list-purchased table and the Japanese papermaking sugeta ( bamboo screen and wooden frame) that I got in Mino City, Japan, when I was an artist in residence at the Mino Paper Art Village Project in 1999-2000. 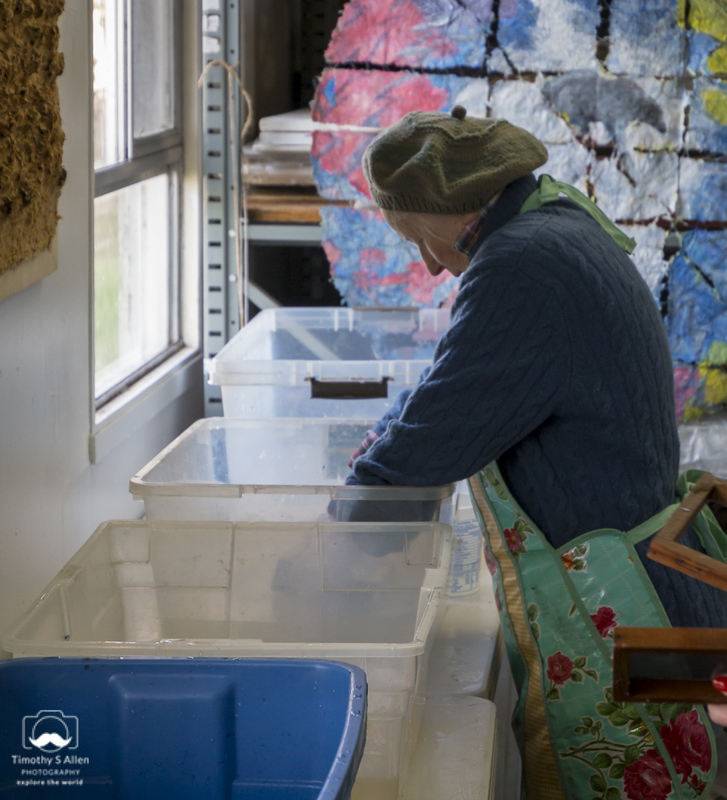 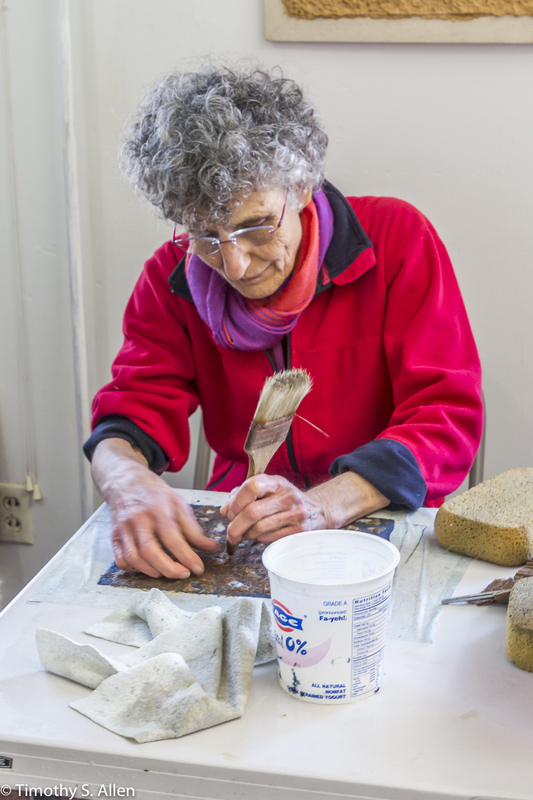 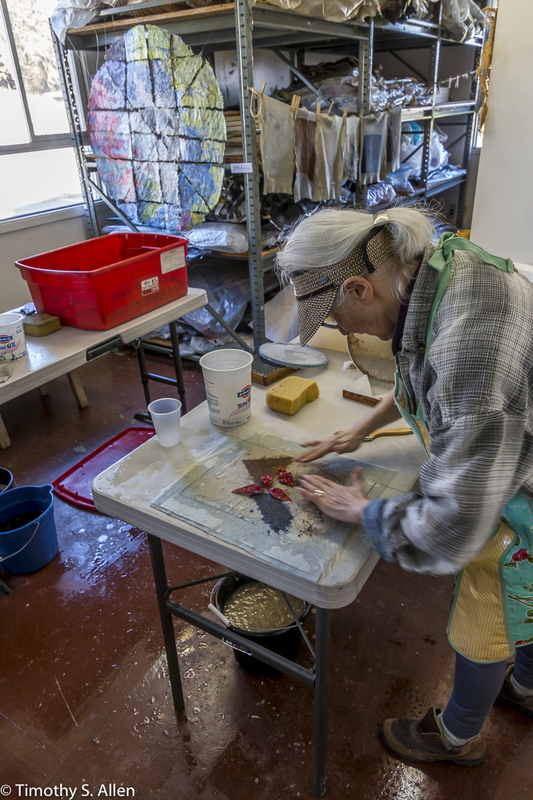 Tina also took some photos of the handmade paper artworks hanging to dry at the studio on Saturday. 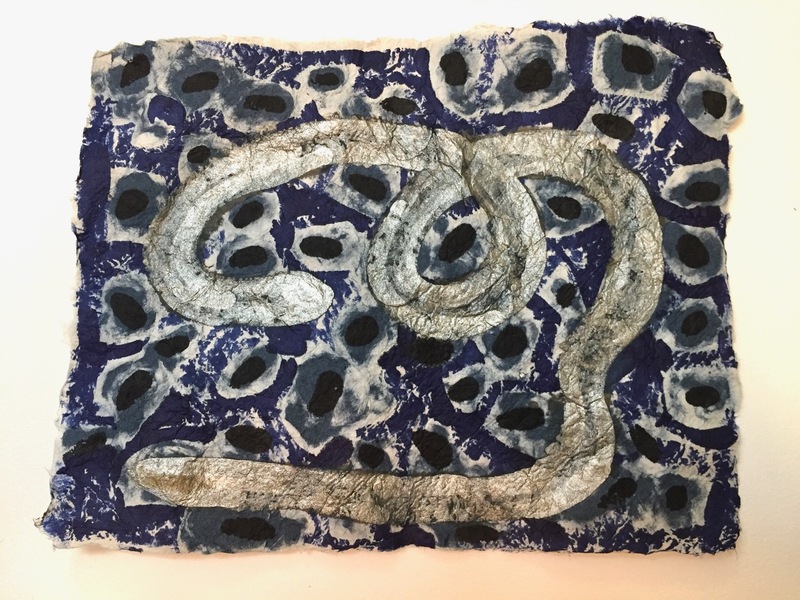 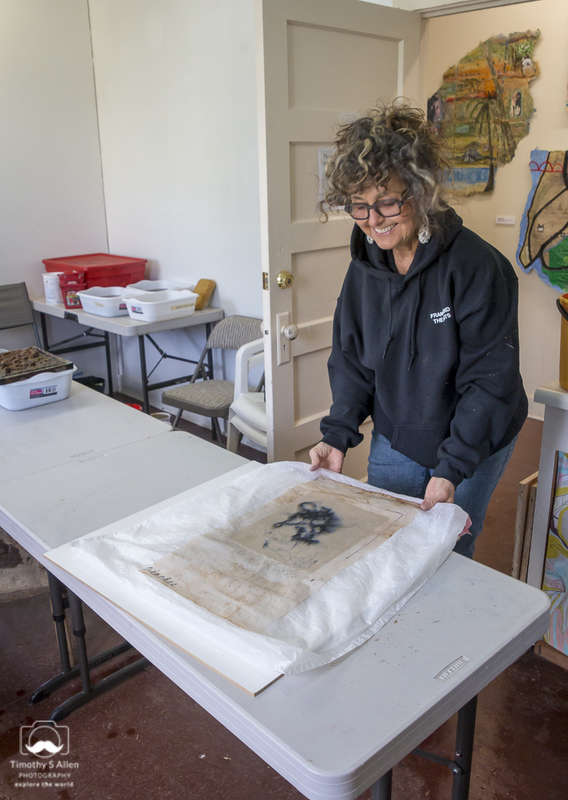 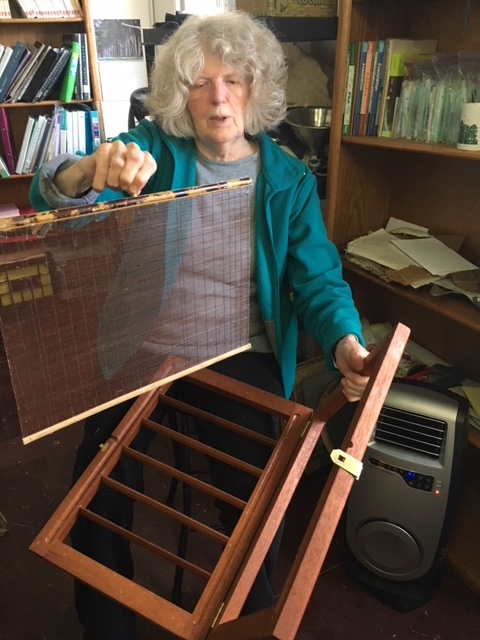 The Exotic Fibers Papermaking Workshop with Jane Ingram Allen will be from 10AM to 4 PM on Saturday, Feb. 24 at Studio Santa Rosa, 3740 Finley Ave., Santa Rosa, CA. 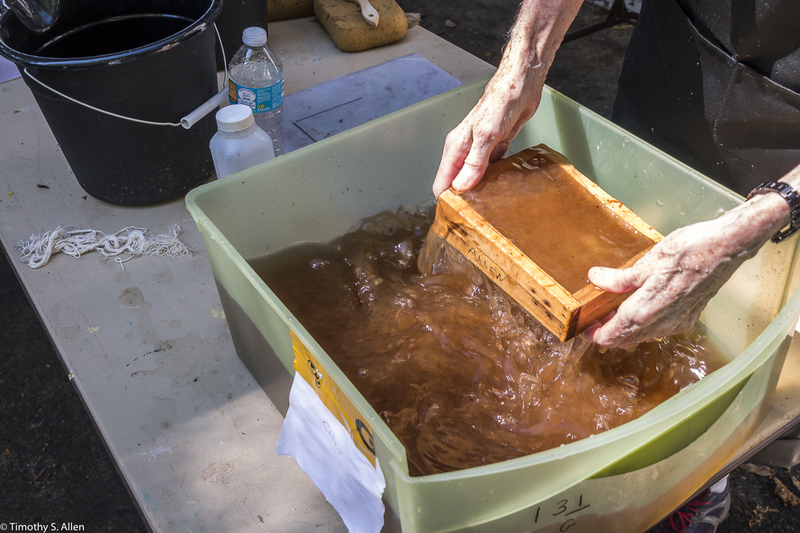 This workshop is already full, but I plan to offer more papermaking workshops in the future. 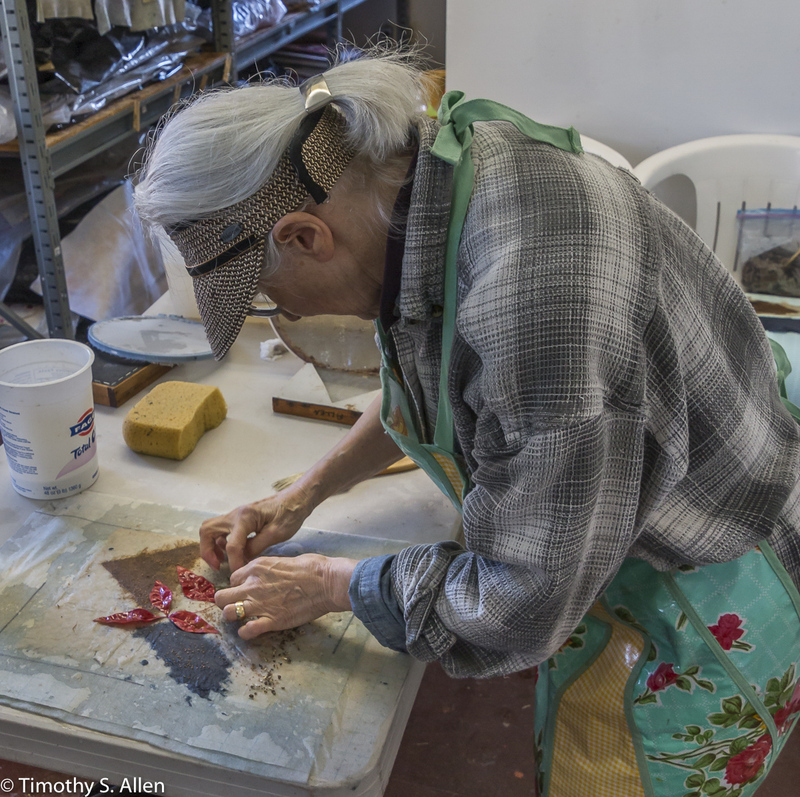 Keep watching this Blog for photos of the workshop and announcements about upcoming papermaking and art workshops. 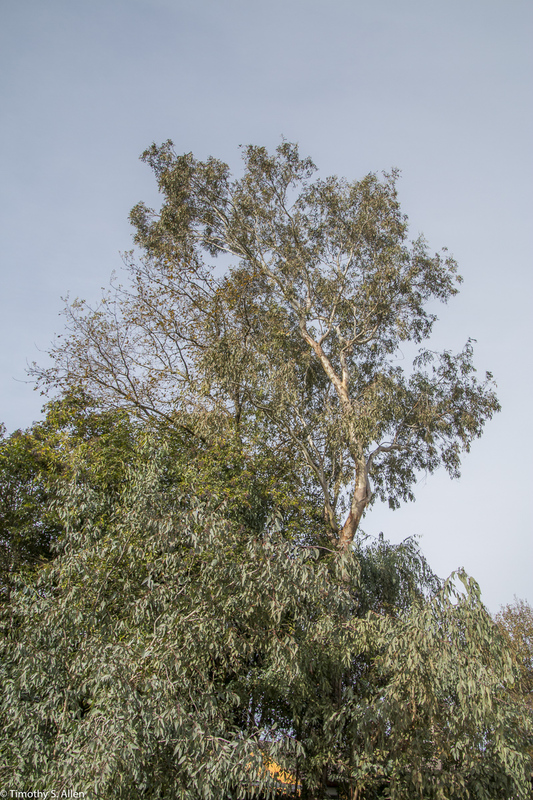 These photos show a eucalyptus tree where I gathered the bark to make paper pulp for the workshop. 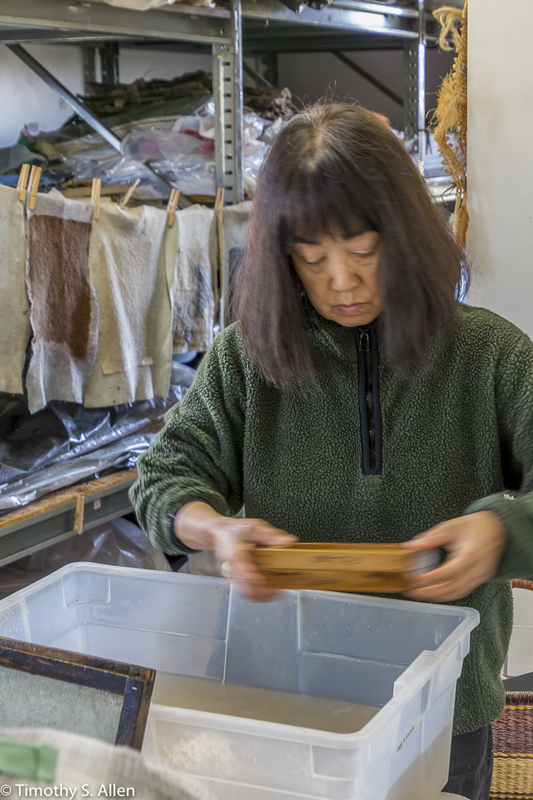 The photo is by my husband Timothy S. Allen (https://allentimphotos2.wordpress.com) Keep watching this Blog for photos of the Exotic Fibers Workshop. 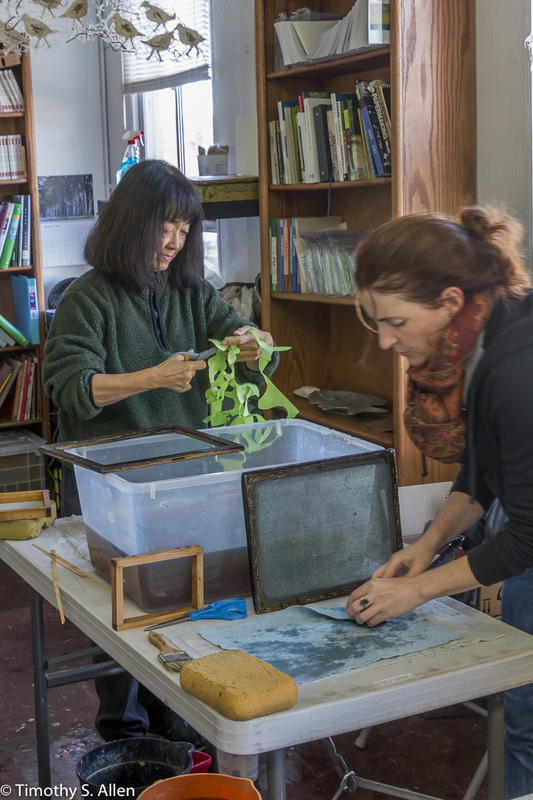 In this workshop students will learn about various exotic plant fibers and how to use them for handmade paper using Asian/Japanese techniques with Western and Japanese equipment and supplies. 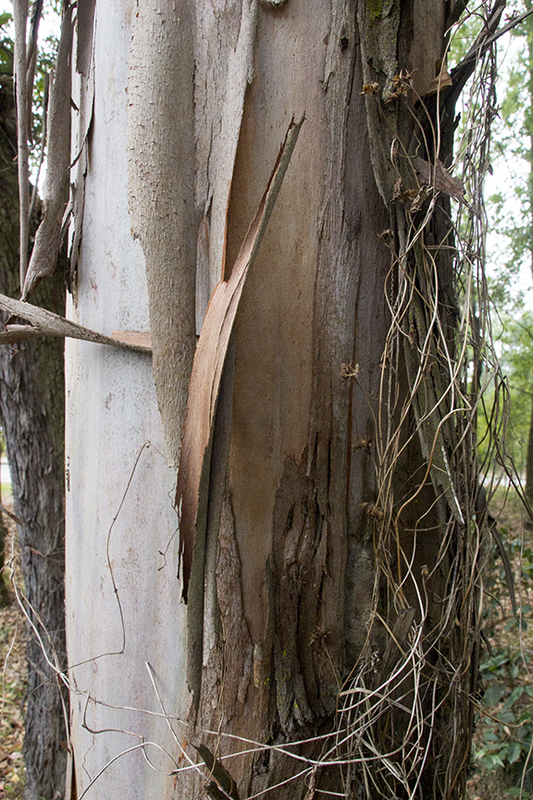 Some fibers we will use include kozo (Paper Mulberry tree bark), lotka (Daphne bush bark from Nepal), Sitka Spruce tree bark from the Oregon coast, Eucalyptus bark gathered in Santa Rosa, and other exotic fibers to create unique handmade paper. 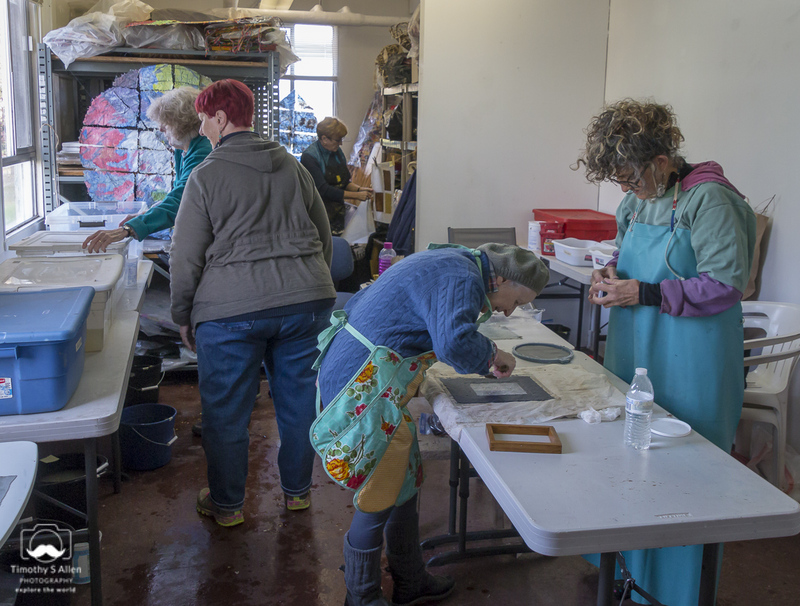 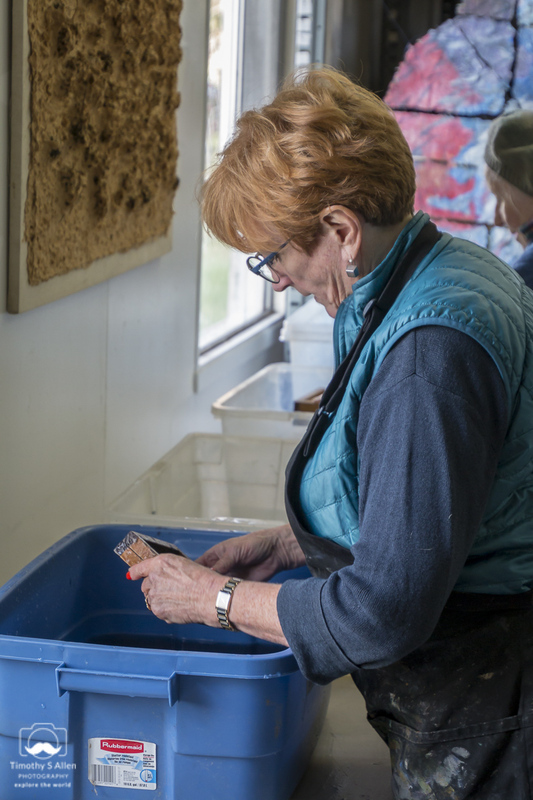 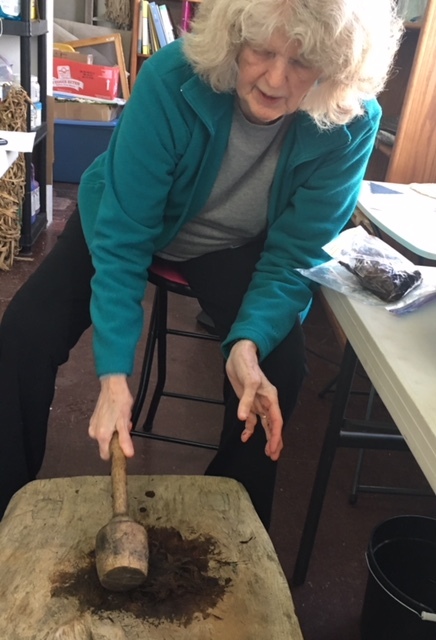 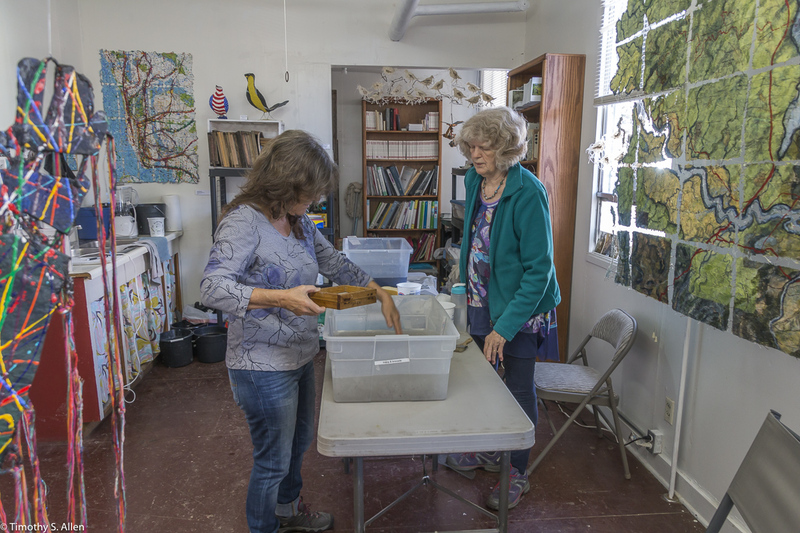 The Introduction to Hand Papermaking Workshop in my Santa Rosa studio on Feb. 10 was loads of fun. 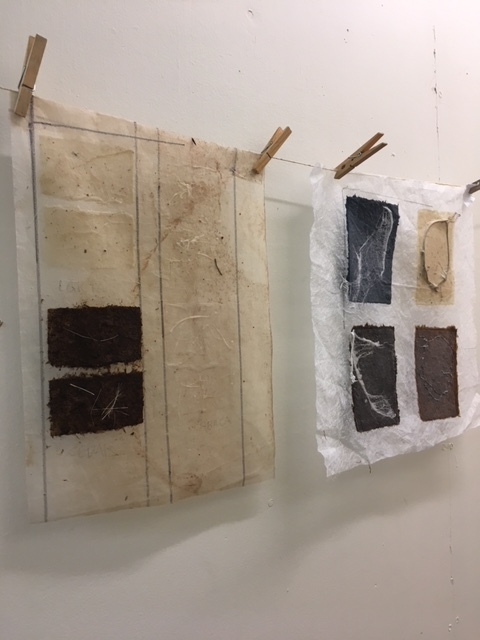 Students learned how to make handmade paper with pulp from blue jeans, abaca (a type of banana leaf) and eucalyptus bark (gathered locally). 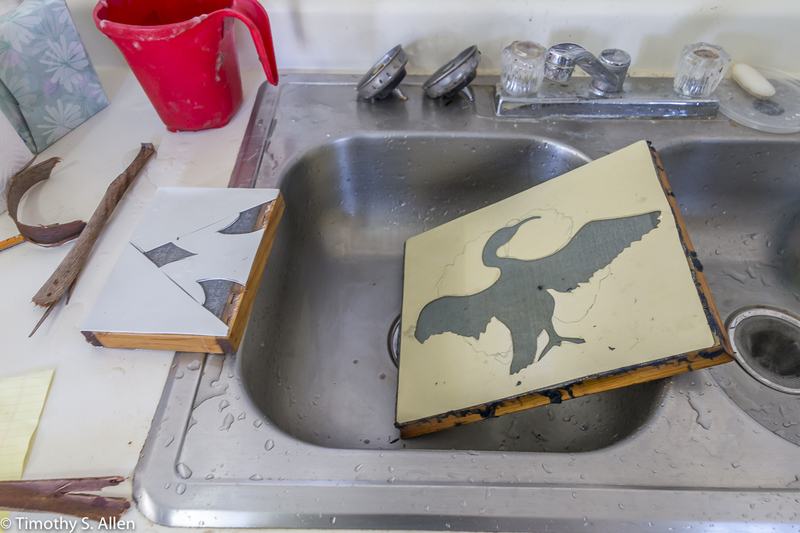 Students also experimented with embossing, laminating and watermarking their handmade paper sheets. 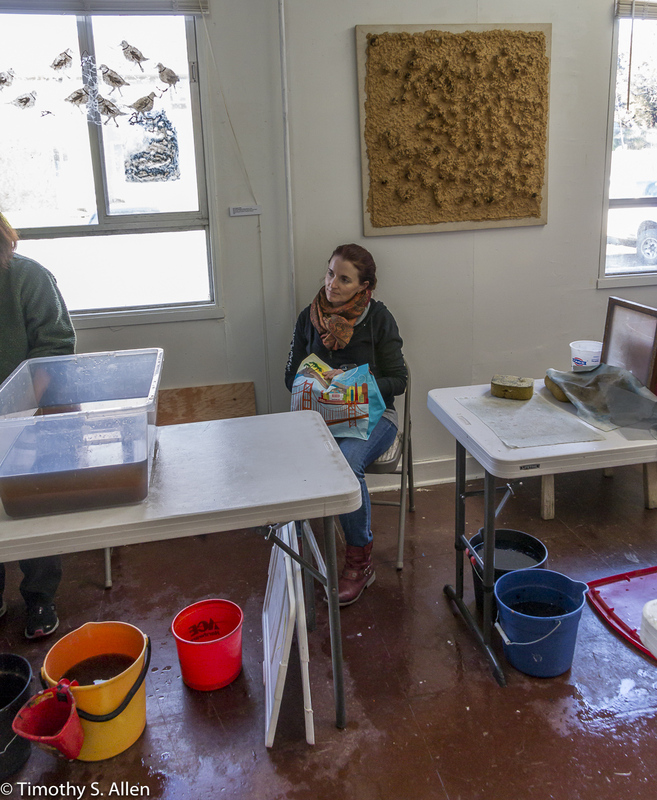 These photos were taken by my husband Timothy S. Allen (http://allentimphotos2.wordpress.com) of the students working in my studio at Studio Santa Rosa, 2740 Wright Road, Studio 107. 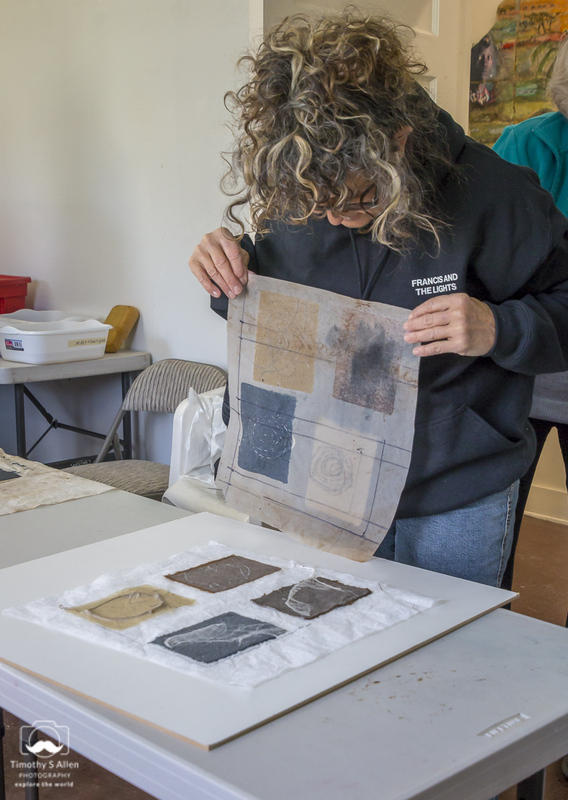 The students seemed to learn a lot in the one-day workshop and had very creative ideas for using handmade paper. 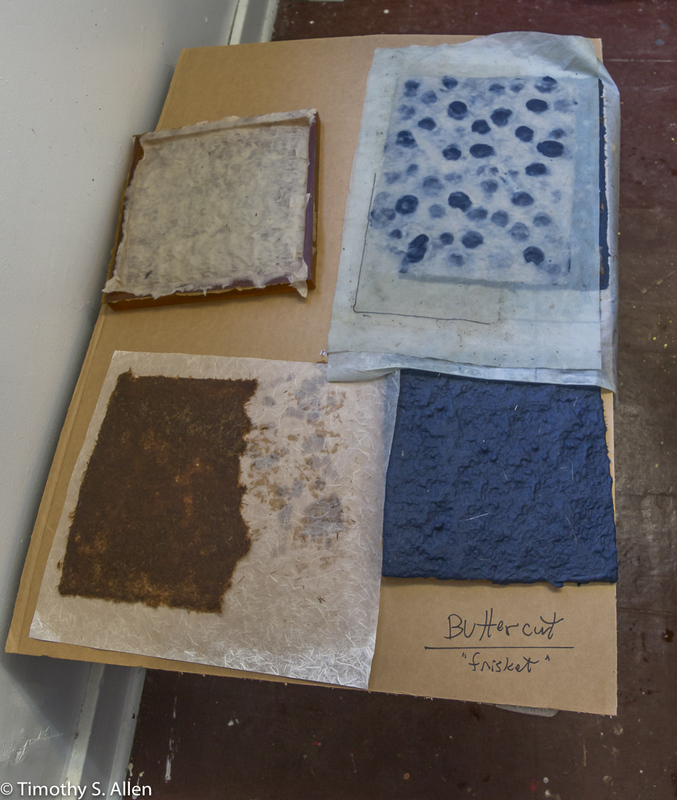 I also received some photos taken by one of the students of her experiments after her handmade paper had dried a bit. 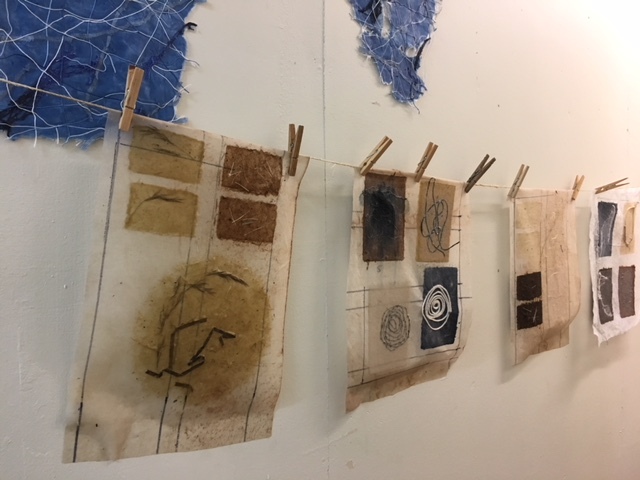 These photos are by Nora Fanshel and show some of her work made during the one-day workshop on Saturday after she did some other things like painting and mixed media on her handmade paper. 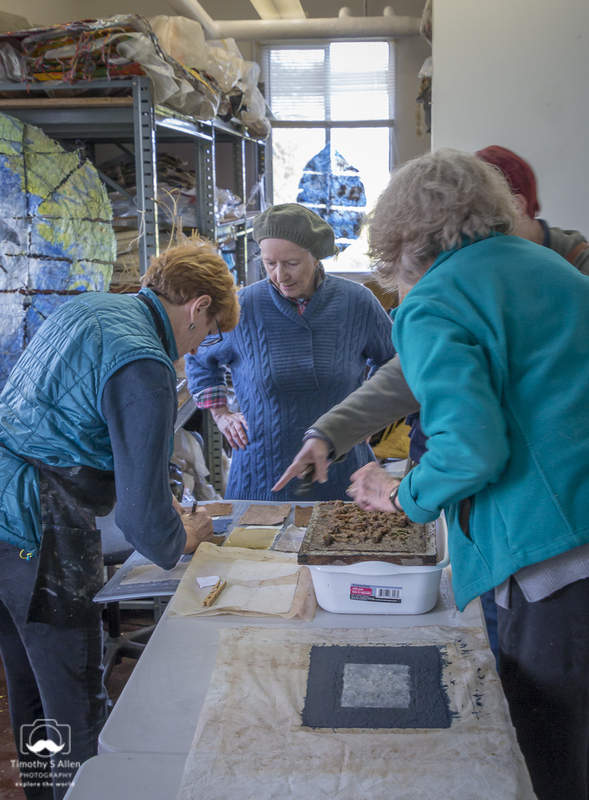 Thanks to all who joined the workshop Saturday, and I look forward to seeing more of your handmade paper artworks. 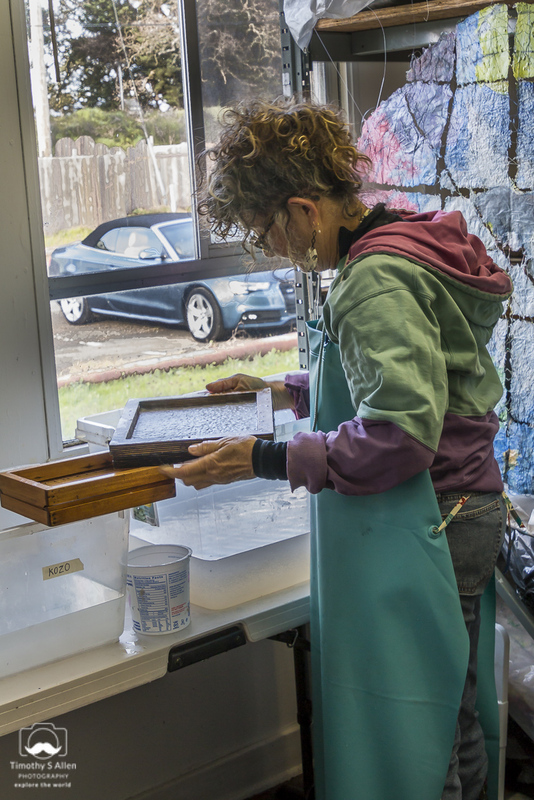 On Saturday Feb. 10 I will teach a class “Introduction to Hand Papermaking. 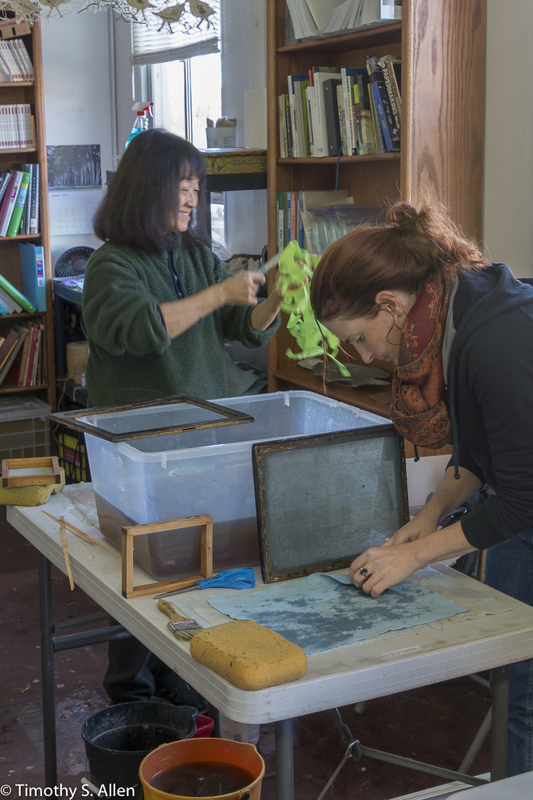 I am happy to announce that the papermaking workshops are all full for the month of February. 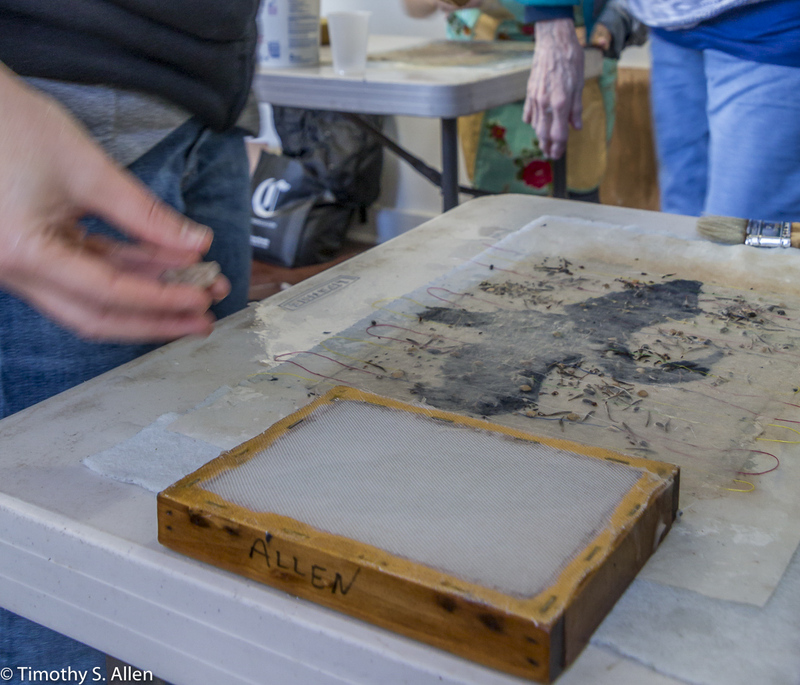 This Saturday, Feb. 10 I will be teaching a workshop titled “Introduction to Papermaking” that includes basic sheet forming with Western techniques using local and purchased pulps and exploring embossing, laminating and watermarking in handmade paper. 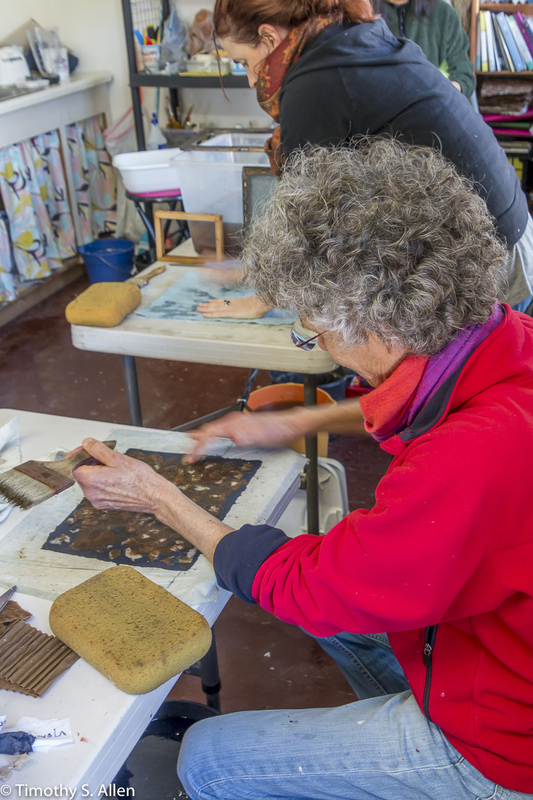 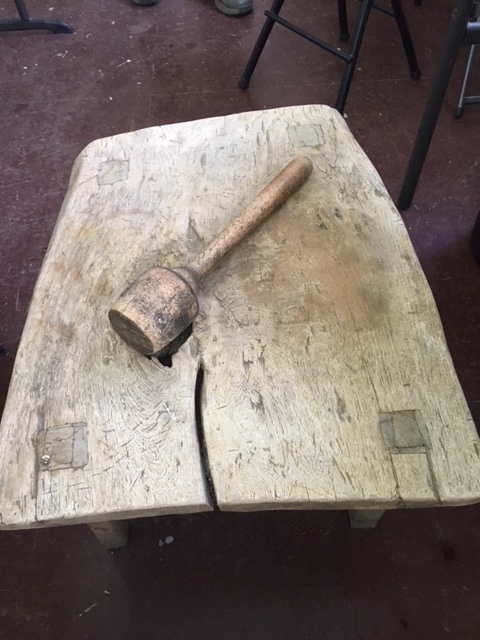 I will post some photos of the workshop next week on this Blog. 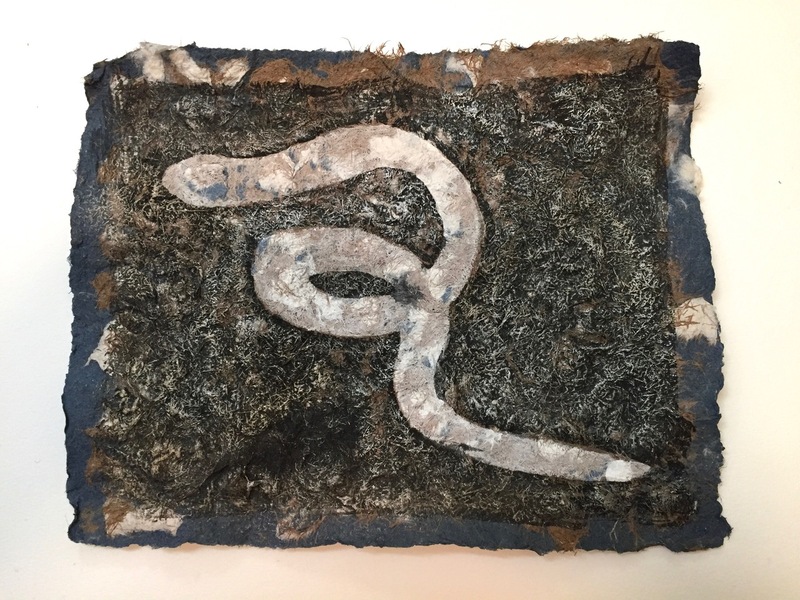 I am also teaching a workshop on Papermaking with Exotic Fibers on Saturday Feb. 24. 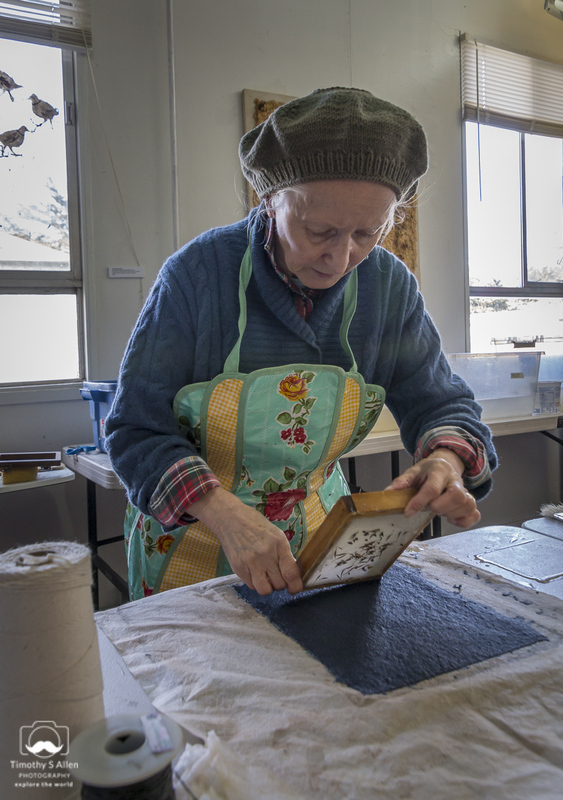 In this workshop students will learn how to make paper in the Japanese or Asian style and use fibers such as abaca, kozo, and local plant materials. 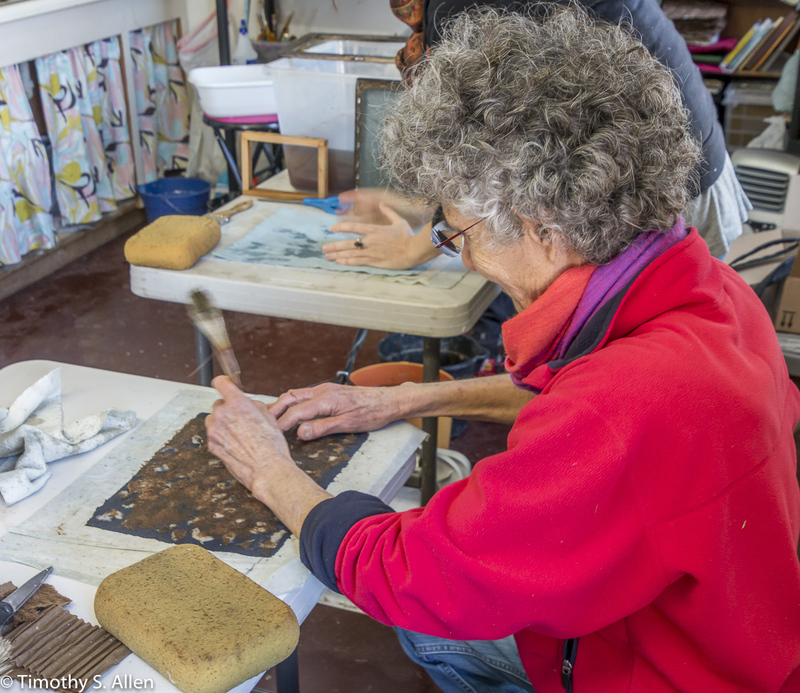 I plan to offer more workshops in my Santa Rosa studio later in the Summer and Fall. 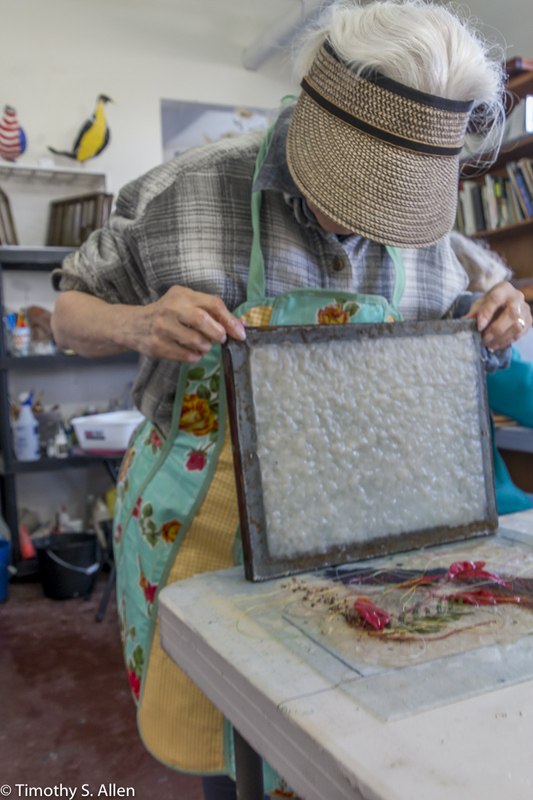 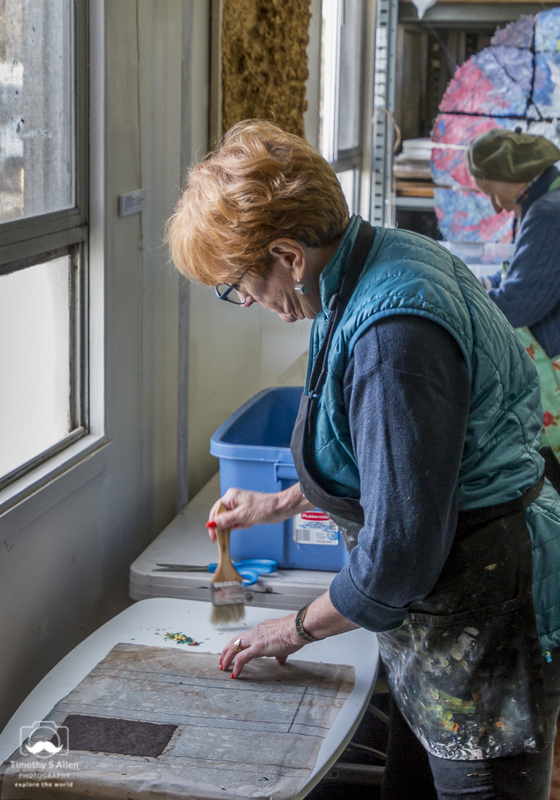 Keep watching this Blog for posts about future papermaking workshops in my Santa Rosa studio. 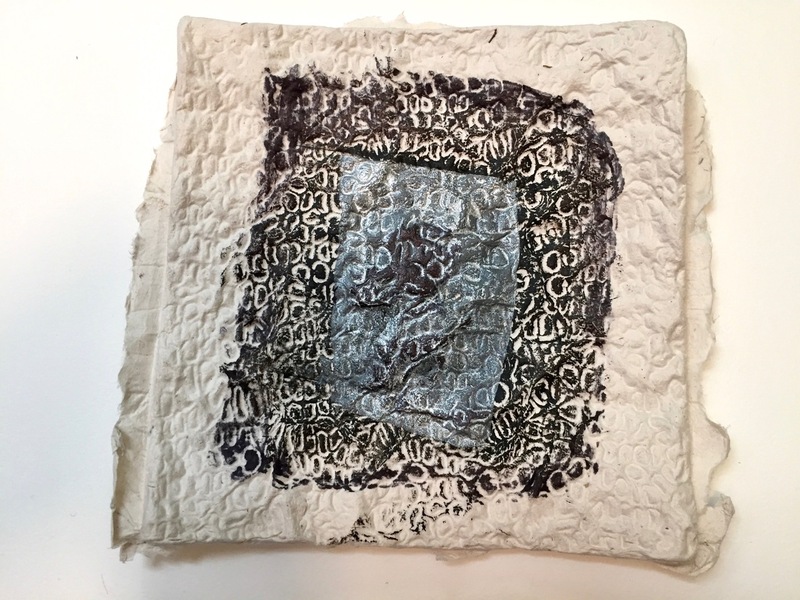 Contact me by email at info@janeingramallen.com for more information.